So it’s the month filled with Guinness as it welcomes the St. Patrick’s Festival. With that celebration coming along, I got an opportunity to dine at Terrace Arms Steak & Grill House, which is located at The Strand. Quite an interesting name right? 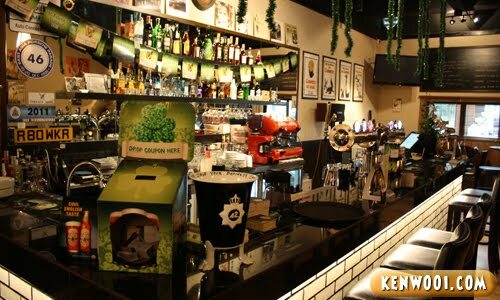 Inside the “house”, you’ll see a typical bar counter that serves beverages. The atmosphere is totally in the mood for St. Patrick’s! 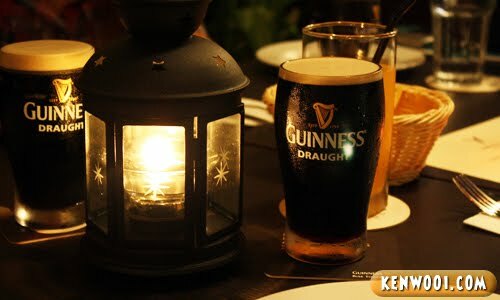 The mood kicks in further when we saw the menu of the night and realized that we’re having dishes infused with the famous black stuff – Guinness. Oh yeah, by the way, these are the food served during the month of March in-conjuction with the Guinness Food Festival. You can have other food such at set lunch from just RM18.80. While some of us ordered fruit juices, it’s somehow compulsory for everyone to have a pint of Guinness with them. Since it’s Guinness Draught, alright – as long as it’s not the bitter Guinness Stout. So, let’s start with the food shall we? 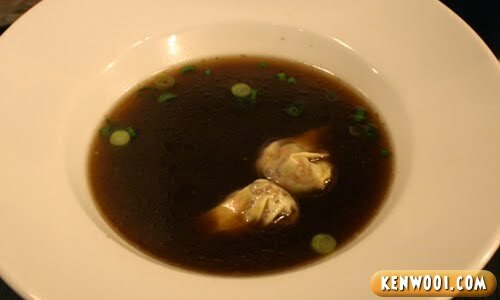 For appetizer, Guinness Beef Consomme with Oxtail Won Tons (RM16.80). As simple as it may be, the consomme (or generally known as “soup”) has a unique taste of its own. The Guinness infusion is mild and the oxtail won tans are simply soft and succulent. Off the menu, we were served with a basket of hard bread. Applied with butter, it’s always nice to munch on it. 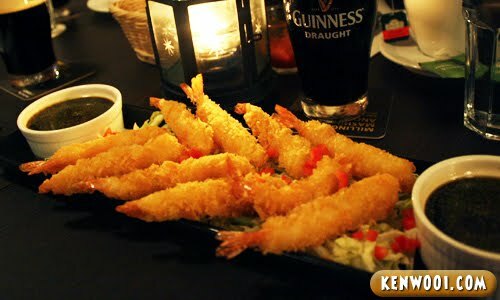 Next up, still an appetizer, is Breaded Prawn with Spicy Guinness Dip (RM22.80). Being crispy on the outside and tender on the inside, one will definitely love the breaded prawn. 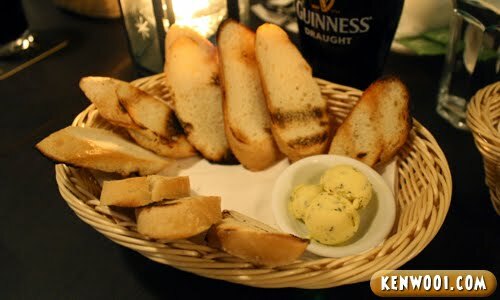 However, think twice before dipping it into the spicy Guinness sauce because the taste could be overwhelming. 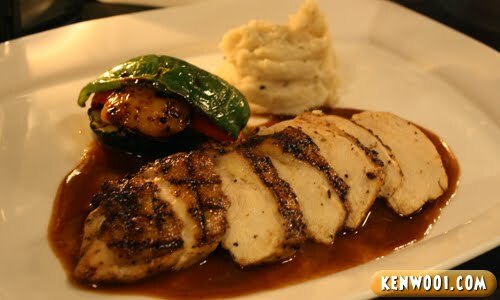 Then, Grilled Chicken with Guinness Sauce (RM26.80) as the main course. 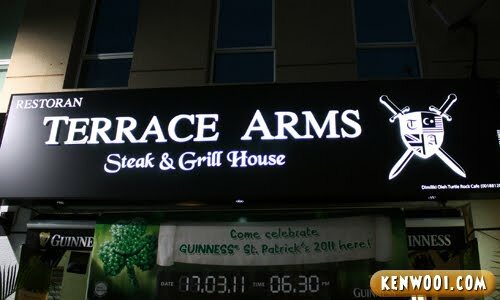 Since Terrace Arms is a grill house, this has got to be its main feature. The presentation is good and I like the fact that it’s sliced into equal sizes. Taste wise, the chicken is delicious and its Guinness infused sauce is mild. It’s also accompanied by some vegetables and mashed potatoes. One thing’s for sure, the mashed potatoes are good. 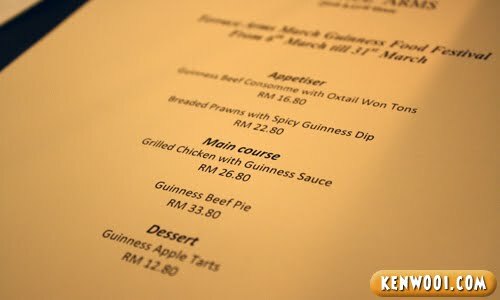 Another main course is the Guinness Beef Pie (RM33.80). 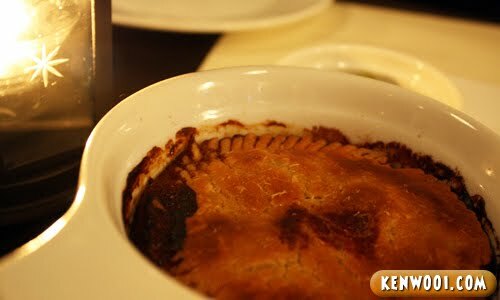 This is one of the best beef pies around, the pastry is well done and its content is scrumptious – it pleases the taste buds. 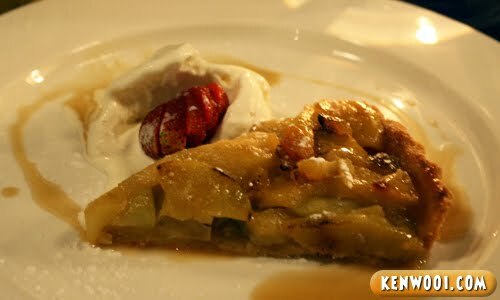 Lastly for dessert, Guinness Apple Tart (RM12.80). Accompanied with a scoop of vanilla ice cream and sliced strawberry, the apple tart is luscious – sweet and savory. Once again, the infused Guinness is mild. Well, that wraps up the food for the night. Overall, they’re simple yet delicious dishes. Oh yeah, besides the food – we were accompanied by local celebrities as well. It was certainly an honour to be dining with Alan Yun and Emily Lim. Okay, err… I may think he’s super handsome, but I didn’t propose him to “merry me” okay? Wahahaha, love the T shirt. Merry me guinness! Wah, party almost everyday…..still got 3 more weeks more to go before month end…., this month lots’ of Yam Seng! LOL! food looks rather pricey considering the taste..
nice dinner.. i hope me the one of this..
Doi..My focus went to the candle light. When I read this post at the beginning, I thought how come sound so serious one? Double check to see if this is Ken’s blog. Indeed it is! Haha! Wow! I love that basket of bread with the butter. Yumz!! Wah! 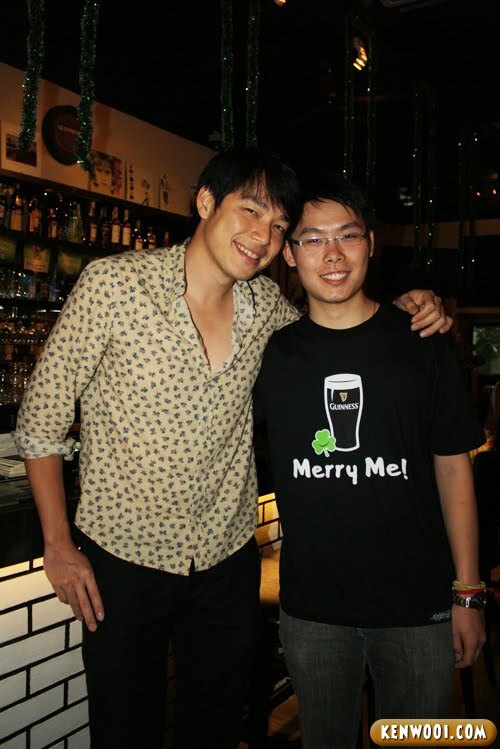 Got pix with Alan Yun also ah? Are u sure Barbie won’t be jealous? LOL!! !